Venous Thromboembolism (VTE) is a cause of hospital mortality and managing its morbidity is associated with significant expenditure. Uptake of evidenced based guideline recommendations intended to prevent VTE in hospital settings is sub-optimal. This study was conducted to explore clinicians' attitudes and the clinical environment in which they work to understand their reluctance to adopt VTE prophylaxis guidelines. Between February and November 2009, 40 hospital employed doctors from 2 Australian metropolitan hospitals were interviewed in depth. Qualitative data were analysed according to thematic methodology. Analysis of interviews revealed that barriers to evidence based practice include i) the fragmented system of care delivery where multiple members of teams and multiple teams are responsible for each patient's care, and in the case of VTE, where everyone shares responsibility and no-one in particular is responsible; ii) the culture of practice where team practice is tailored to that of the team head, and where medicine is considered an 'art' in which guidelines should be adapted to each patient rather than applied universally. Interviewees recommend clear allocation of responsibility and reminders to counteract VTE risk assessment being overlooked. Senior clinicians are the key enablers for practice change. They will need to be convinced that guideline compliance adds value to their patient care. Then with the support of systems in the organisation designed to minimize the effects of care fragmentation, they will drive practice changes in their teams. We believe that evidence based practice is only possible with a coordinated program that addresses individual, cultural and organisational constraints. Health systems around the world are under financial pressure and reform measures are intensifying. Such measures often emerge as efforts to standardise clinical practice. Evidence based Clinical Practice Guidelines are being used increasingly as a strategy for achieving consistency across clinical areas and within practice. While there is increasing evidence of patient benefit from the utilisation of Clinical Practice Guidelines, clinician adherence and implementation remains poor and the failure to change clinician behaviour with the implementation of guidelines has been demonstrated in many areas of healthcare [1–3]. One such example of poor compliance with guidelines relates to the prevention of venous thromboembolism (VTE) for hospitalised patients. VTE manifests as deep vein thrombosis (DVT) and/or pulmonary embolism (PE). It spans hospital specialties and is usually incidental to the problem with which a patient presents to hospital. Nonetheless, the consequences of VTE are substantial. VTE contributes to as many as 10% of hospital deaths [4–6]. In addition, it is associated with significant morbidity from recurrent thrombotic events, post thrombotic syndrome (characterised by debilitating leg pain, swelling and fibrosis, and in severe cases, leg ulcers ) and pulmonary hypertension . As such VTE results in major socioeconomic decrements in terms of family disruption and loss of time in the workforce for these patients. In Australia annual VTE associated costs, including the costs associated with premature death, are said to be as much as 0.15% of the Gross Domestic Product . Effective prevention of VTE will save lives, improve patient outcomes and reduce healthcare costs. Prevention of VTE for hospitalised patients is relatively easy and inexpensive. Evidence based guidelines (e.g. [10, 11]) and Government policies (e.g. ) advocate risk stratification screening of patients and the use of thromboprophylactic medications (daily or twice daily sub-cutaneous injections of anticoagulants) or mechanical devices (e.g. wearing graduated compression stockings) for high risk patients for the period of their hospitalisation. However, large international audits have shown that thromboprophylaxis is not consistently applied by clinicians in hospital practice: only 39% of 'high-risk' medically ill patients and 58% of 'high-risk' surgical patients were receiving appropriate prophylaxis [6, 13, 14]. A number of strategies have been tried to improve risk assessment and thromboprophylaxis implementation. Like implementation strategies for numerous other guidelines , the strategies used for VTE prophylaxis guideline implementation have included education programs, computer and human reminder programs, audits and feedback. However, like other guideline implementation studies none have been overwhelmingly successful in achieving clinician behaviour change, and even the most successful usually fail to achieve sustainable change over time . Grimshaw et al. recommend that effective guideline implementation requires exploration of clinician practice and behaviour. Therefore, the aim of this study was to i) identify doctors' attitudes towards VTE prophylaxis; ii) understand the clinical environment in which VTE prophylaxis is implemented, and thus try to elucidate the barriers to clinicians implementing VTE Clinical Practice Guidelines and obtain stakeholder input and ideas so that appropriate strategies for practice change can be developed. Exploratory descriptive study methods  using face to face semi-structured interviews were implemented to understand attitudes and the clinical environment surrounding the application of VTE Clinical Practice Guidelines for hospitalised patients. The study sites chosen were two tertiary referral hospitals in Sydney, Australia. Both sites are located within one area health service and are metropolitan based. Data was collected between February 2009 and August 2009 at the first hospital (n = 34 interviews), and in August 2009 at the second (n = 6 interviews). The interviews undertaken at the second hospital were intended to confirm or counter findings from the first site and thus to clarify whether the findings may have been institution specific. At the time of the study both hospitals had policies in place recommending VTE and bleeding risk assessment of all patients admitted. Both hospital policies list potential VTE risk factors and as per the recommendations of the Australian and New Zealand (ANZ) guidelines that were current at the time  recommend that in the presence of any VTE risk factor that VTE prophylaxis be implemented: chemical prophylaxis in the absence of bleeding risk factors and mechanical prophylaxis in all other patients. Both hospitals have haematologists with particular research interests in VTE and the main hospital has a history of VTE education sessions at Grand Rounds and a year prior to the current study had participated in a study with multiple education interventions intended to improve VTE prophylaxis . A convenience sample of doctors working within both hospital sites at the time of the study were eligible to enrol. Representation was sought from a variety of medical and surgical specialties although Paediatrics, Radiology, Dermatology and Mental Health clinicians were excluded from the study due to there being few patients at high risk of VTE and thus few who need prophylaxis in these therapeutic areas. Junior doctors (Interns and Registrars (JMO)) were enrolled at different stages within their medical training. They were randomly selected using the hospital database paging system. Those who answered their page were provided with a study description and invited to take part at a location and time of their convenience. Senior doctors (both physicians and surgeons) recruited for the study and were initially invited by email. Recruitment continued until new interviews were generating no new themes i.e. data saturation was achieved. Fourteen semi-structured open-ended questions (in a format recommended by Creswell and Clark ) were designed to explore clinicians' opinions, knowledge, beliefs and usage of Clinical Practice Guidelines. The questionnaire (see table 1) was designed to be non-leading with deliberate exclusion of key words. All interviews were conducted by a researcher independent of the hospital and its staff. Questions were conveyed in a casual conversational manner in order to establish rapport. This approach allowed respondents to express their opinions and ideas freely without bias or pre-conceived ideas imposed by the investigators. When you are presented with a patient with a particular problem how do you ensure the appropriate care is provided and no aspect of care is overlooked? How are changes or new research findings incorporated into your practice? Some people think there is some variability in the practice of medicine. Why do you think this perception exists? How is consistency of treatment ensured in your area? In general what do you know and how do you feel about VTE prophylaxis? What influences whether a patient is VTE risk assessed in your ward and who oversees the assessment? What is the process in different parts of the hospital for a patient receiving or not receiving VTE prophylaxis? What is your role? How often do you check junior staff are doing what you assume should be done and what you have asked to be done? What was it about that patient or their management that has resulted in them receiving or not receiving prophylaxis? Would you manage medical patients differently to surgical patients with regards to VTE prophylaxis? How have you gained your information and knowledge about VTE prophylaxis? Do you know of anyone who has had poor outcomes because of VTE prophylaxis, or lack thereof? Has it changed your perspective? How do you feel about the way this hospital manages/uses VTE prophylaxis in general? * Questions added after completion of first 8 interviews. The study was approved by both hospitals' Human Research Ethics Committees as well as that of the University of New South Wales. All participants gave written informed consent for their interview to be recorded and analysed. All data was de-identified and remained anonymous for analysis. Data was stored and maintained within a password protected file. The interviews were recorded using an Olympus digital voice recorder (DS-3300) and transcribed verbatim into Microsoft Word and saved as 'read only' files for analysis. Demographic data (including age, current ward, years of experience, and time working in the current role) was obtained from each participant at the time of interview. Interview data was transcribed by the researcher who conducted the interviews. Interview transcripts were then analysed using coding methods described by Creswell and Clark . This included line-by-line open coding where conceptual labels within the transcripts were developed and then grouped into categories. A qualitative software program (NVivo™) assisted managing data files by linking codes and categories, and organising ideas into main themes. Initial coding of the data in six transcripts was conducted independently by three co-investigators. The coding was then reviewed, rationales for codes were discussed, and some categories were changed as a result. After the intra-rater checks were completed, a single coder completed coding and analysis of the remaining data. Forty clinicians from medical and surgical specialties, and different hierarchical role positions took part in the study. Details of medical specialities enrolled are represented in Figure 1. The interview participants' demographic data are presented in Table 2. Complete interviews were conducted with 39 of the 40 interviewees. One interview was incomplete as the participant was called to a medical emergency and did not wish to resume the interview. The average interview duration was 20 minutes. There were no thematic differences identified in the data collected from the two hospital sites. 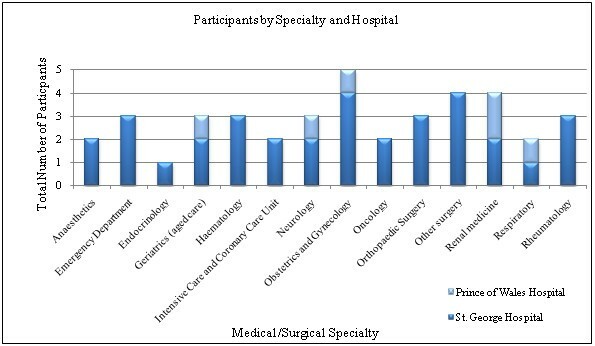 Data displaying medical and surgical specialties of clinicians interviewed (n = 40). Interviews identified three key themes influencing clinician behaviour and beliefs with respect to VTE Clinical Practice Guidelines: 1) 'Guidelines: friends or foe'-clinicians' attitudes about VTE thromboprophylaxis and guidelines; 2) 'Practice Culture' which describes an environment in which medical team rejection, adherence or utilisation of guidelines is driven by team member influence; and 3) 'Fragmentation of Care'-a major barrier to guideline compliance, VTE risk assessment screening, and implementation of medication prophylaxis in hospitalised patients. Under this theme we describe an attitude which, despite general support for the VTE prevention guidelines, does not encourage the changes in clinical behaviour patterns necessary to adhere to guidelines. Participants described how senior clinicians practice an 'art of medicine' which has been defined elsewhere as the combination of medical knowledge, intuition, experience and judgement . Clinicians develop preferences or an 'art' towards patient management and treatment medicine which is considered to take precedence over guidelines. With respect to VTE prophylaxis, clinicians reported taking guidelines into consideration but rarely considered they should or could be applied universally. Medicine is not a science, it's an art, so you cannot implement a protocol to every single patient. Interview 14-Registrar, Surgical ward. Thus senior clinician's behaviour often intentionally deviated from guideline practice. Based on their personal experiences they reported making conscious decisions not to implement evidence based guidelines. Senior clinicians reportedly were motivated to consider either applying prophylaxis or withholding prophylaxis because they wished to prevent litigation or retribution, or to prevent a past adverse experience when one of their patients was or was not given VTE prophylaxis. You will find that if a consultant has had a particularly severe adverse event from something, they will be reluctant to use it whereas it might be evidence based best practice to do so. Senior clinicians who had had a patient who suffered or died from a pulmonary embolism as a result of a lack of prophylaxis were more likely to be conscientious with subsequent patients. If you're working on the surgical ward and you see someone get PE and have a bad outcome, you're much more vigilant in the future about trying to prevent it. However, a significant number of interviewees seemed to be overly concerned with their patients being at risk of bleeding as a result of prophylaxis with anticoagulant medication (on occasion following experiencing having a patient with a serious anticoagulant related bleed). They used this concern as justification for not using anticoagulant medication especially when combined with their strong desire to do 'no harm' to their patients. Contrary to the Australian guideline recommendations  that were in use within both of our institutions, the majority of interviewees reported that their primary criteria for deciding whether a patient should receive prophylaxis medication or not, was the patient's mobility or immobility. I think DVT Prophylaxis in some form should be compulsory for every single patient that presents in to hospital, even mobile patients. I think that in hospital people are still much less mobile than when they are at home or in their work setting. So even if someone's mobile the reality is they are just probably mobilising to the toilet and back. Thus although the majority of interviewees had no particular concerns with the VTE Prophylaxis Clinical Practice Guidelines, the prevailing medical behaviour adhered to 'adapting practice' for individual patients rather than the 'cook-book' approach of the Clinical Practice Guidelines. Organisational culture is seen as a set of norms, rules, values, philosophies, attitudes, and meanings distributed within a group and that manifest in their behaviour and thus their observable practices . The 'Culture of Practice' described in our interviews was one of a very hierarchical team environment where senior clinicians prescribe practices within their teams. Our hospitals as organisations are an environment in which we saw the 'community of practice' described by Fenlie et al. where one doctor within a team cannot adopt significant changes to practice without discussion and consent from colleagues within the team. VTE prophylaxis practice varied from one ward to another and from one senior clinician to another. Junior staff reported adapting their behaviour and practices to that of their current senior clinician and medical team. The biggest influence [on my practice] is just what my seniors do on that term, so my practice would change from term-to-term depending on what my seniors do and want. Yeah, I've looked at [the VTE prevention guidelines] a couple of times, mostly though you just get into a pattern of what your bosses like and that's what you end up doing. However with no consistency of practice and constrained by the need to conform with team behaviour and actions, Junior Medical Officers (JMOs) often lack the confidence required to apply evidence based practice. Thus interviewees identified a team approach that was focused on shared values and beliefs about practice, which were largely directed by senior clinicians' preferences often despite prevailing evidence. Junior Medical Officers embraced the team culture modifying their own behaviour to align it with that of more senior team members. 'Fragmentation of care' is used to describe specialty based medical care which has led to some responsibilities being unclear. Compounding the situation is the often less than ideal communication between the hospital team members themselves. Interviewees described VTE prophylaxis 'falling through the gaps' due to oversight. It was overlooked as focus was being given to the presenting illness and treating the medical symptoms rather than problems that may or may not develop throughout the hospitalisation. 'Specialisation' of care was also used to explain VTE 'blindness' by staff: clinicians' practice is focused on providing medical treatment for particular areas of specialty rather than holistic patient care. Specialisation contributes towards the fragmentation of care. Generally, there was a lack of consistency about whose responsibility it was to consider VTE screening and prophylaxis medications. This was in terms of which medical team speciality was responsible for this intervention, as well as which member of the medical team should undertake the screening and write up the medication order (junior or senior medical staff). Although, there was consensus that VTE risk assessment should occur early in a patient's admission, different medical specialties disputed whose role it was to consider VTE screening and prophylaxis medications. For example, there was some dispute amongst participants as to whether VTE screening should be conducted by Emergency staff or by the admitting medical in-patient team. After-hours care puts patients at greater risk of being missed for VTE prophylaxis as hospital staffing numbers and experience levels are commonly reduced. Participants identified that lower after-hours staffing and expertise reduced opportunities to consider VTE risk and that patients coming into hospital, after-hours, would often fall through the gaps. If it's not remembered at admission then no one remembers it a week down the track and then its two weeks down the track and your patient has a PE, so I think that's one problem. In addition to a lack of clarity between medical teams, there was no clarity about who is responsible within a team for VTE risk assessment. Although, with the exception of one, all senior clinicians interviewed felt that VTE prophylaxis management could be delegated to junior staff members. However, it appeared that junior doctors infrequently initiate VTE prophylaxis without direction. Thus in a time poor environment with multiple teams and multiple clinicians within the teams contributing to the care of an individual patient, the cross functional responsibility of VTE implementation and management is susceptible to being overlooked. Acknowledging that VTE is not a priority, the interviewees repeatedly highlighted how time poor they were when reviewing individual patients. Thus for VTE risk assessment screening to be incorporated into everyday practice, it needs to be easy to implement, and implemented in some sort of routine way. Interviewees recommended that there should be simple reminders that could be used as a record of risk assessments having been completed. It's probably best to assign one person... someone at the ward level who checks it for everyone. Interviewees suggested a sticker in the medical charts may be an appropriate prompt for staff to undertake VTE screening. Interestingly, our primary study site uses a prompting sticker system. A recent medical record audit we conducted identified that all patients had the bright blue prompt sticker in the notes. However, few if any of the stickers had been completed. Guidelines are intended to 'improve quality of care by decreasing inappropriate variation and expediting the application of effective advances to everyday practice'. Adoption of VTE prevention guidelines is expected to save lives, improve patient outcomes and reduce healthcare costs. Nonetheless, like many areas of healthcare [1, 23], adoption of VTE prevention guidelines is suboptimal [13, 14]. This study gathers information about clinician attitudes and the clinical environment in which clinicians are working and establishes that the barriers to implementing Clinical Practice Guidelines for VTE prophylaxis are multi-factorial. It is not surprising therefore that single approaches to improving VTE prevention are rarely effective . However as recommended in practice change literature [22, 24–28], having identified the barriers, multilevel and systematic strategies for changing practice can be proposed. The attitudes towards VTE prophylaxis and the guidelines that were elucidated in the interviews suggest that in the first instance individual clinicians need to be convinced that change is necessary. Clinicians need to know how their practice differs from guideline recommendations and then they need to believe that changing to guideline recommendations will improve outcomes for their patients. The majority of our interviewees believed that VTE prophylaxis was well implemented in their hospital. This is contrary to what is observed internationally [13, 14], but also contrary to audit data collected coincidentally at the primary study site (unpublished data) where we found 36% of patients at high risk for VTE are overlooked for prophylaxis during their hospitalisation. A traditional audit and feedback approach could well address this barrier to guideline adoption. More difficult to address is the need to convince clinicians that following the guideline recommendations will be in their patient's best interests. The current environment in Australia promotes the use of VTE prophylaxis in hospitalised patients: the National Health and Medical Research Council has identified VTE prevention as a priority area for improving patient safety and has generated national guidelines  and State Health Departments are preparing policies to enforce risk assessment and VTE prophylaxis implementation. The result of this activity is perhaps the heightened awareness evident in the interview data of VTE as a condition of importance and a condition worth preventing. However although, all our interviewees knew guidelines existed, and 98% expressed an opinion consistent with support for VTE prevention guidelines, clinicians, particularly those managing medical patients, considered that the guidelines were not intended to be applied universally but more to act as a guide for adapting practice to individual patients ('the art of medicine'). We found personal experiences rather than guidelines dominate practice behaviour, beliefs and values. Instead of referring to guidelines to guide clinical decision making and practice, each clinician's practice is based on their experiential knowledge gained and continually updated and amended during their education, conferences, discussions with colleagues and management of individual patients. Gabbay and LeMay  describe this acquisition of knowledge for applying to medical practice as developing 'mindlines' rather than guidelines. This was evident by interviewees exaggerating the bleeding risks associated with anticoagulants at prophylactic doses and exaggerating immobility as a VTE risk factor, and by the variations in team practice described by junior doctors. If guideline directed care for VTE prophylaxis is going to be embraced by clinicians, there has to be clear evidence that its implementation will add benefit to their current practice for patients. Perhaps it is time to alter traditional approaches to rolling out Clinical Practice Guidelines. Like the majority of evidence based guidelines, guidelines for VTE risk assessment and prophylaxis application are based on clinical trial evidence. However, clinical trials by their very nature include only a select group of patients [30, 31], and guidelines are an extrapolation from these select groups to broader population groups. For example Tapson et al. report that less than 12% of real world medical patients fulfil VTE prophylaxis clinical trial inclusion criteria. Although, VTE prevention guidelines are generally accepted and advocated [10, 33, 34] within the medical community, they are not completely without controversy because of the clinical trials upon which they are based [35, 36]. If a research study demonstrated that consistent application of VTE guidelines results in an improvement in clinical outcomes (in this case less deep vein thrombosis, pulmonary embolism, and bleeding events) as well as being cost effective, would senior clinicians be sufficiently motivated to switch to a 'cookbook' approach? It is an approach to rolling out treatment guidelines that has yet to be tried at least in VTE prophylaxis. Sustainable changes to clinical practice need to be driven and championed by individuals. As our exploration into the clinical environment suggested, to encourage a culture of evidence based practice within health care systems, senior clinician support is critical. The participants in our study describe a culture where there is already very little variation within a team (the senior clinician leading the team prescribes the practice of the clinicians within the team). The social context of practice is autonomous and hierarchical with junior staff altering their behaviour to reflect that of their current team's senior clinician. It is one which fosters a team approach and fosters consistency within that team. In this way organisational culture can be remoulded. In the case of VTE prophylaxis, our results suggest that if senior clinicians' practice is consistent with guidelines, members of their teams will follow suit. However the clinical environment we described was also one of competing priorities. VTE risk crosses all medical specialties and as such needs to be considered for nearly every patient admitted to hospital. Even with the best intentions, with the multitudes of competing priorities when a patient is first admitted to hospital, and with the inherent care fragmentation of multiple teams and multiple members of teams looking after each patient, it is regularly overlooked. Role confusion within teams, and between teams, was a recurring theme and is consistent with the findings of Cook et al. who postulate that the intra- and multidisciplinary care inherent in hospital patient management, results in unclear role accountability. The World Health Organisation listed communication during patient care handover as one of its 'high 5' patient safety initiatives to improve continuity, safety and ultimately the outcome of care . Interviewees reported that communication between teams about whether risk assessment had been done was lacking. The lack of adequate documentation adds to role responsibility confusion- who in the team as well as which team should be managing VTE prophylaxis? Role responsibility needs to be clarified across the organisation and systems need to be implemented to facilitate documentation and handover communication in the fragmented system of care functioning in hospitals today. VTE prophylaxis is more consistently applied to surgical patients than medically ill patients . Since the incidence of VTE in untreated patients varies little between medical and surgical patients , the difference may be due to the fact that the importance of VTE prophylaxis for surgical conditions has been supported for a much longer period of time. It may be related to the fact that VTE guidelines are more consistent and easier to apply in the surgical patient cohort. Alternatively, it may be related to its routine consideration and charting as part of the pre-operation work up for the patient. By having guidelines embedded in structural processes and clearly articulating role responsibilities with regards to VTE risk assessment and prophylaxis implementation, it seems it is more likely to be considered and appropriately prescribed. The fact that clinicians do not routinely refer to guidelines, that they are time poor and have many competing priorities, suggests that tools to address the fragmented care present must be simple and effective. These could take the form of reminders (e.g. computer alerts or human reminders or less sophisticated paper cues (e.g. lists and stickers)). Kucher et al  have demonstrated that a computer alert on electronic medical records decreased the occurrence of DVT and PE by 41% compared to patients whose doctors were not prompted for VTE prophylaxis with an electronic-reminder [39, 40]. In the absence of suitable technology, having a dedicated VTE prophylaxis support position such as a nurse practitioner within a hospital has been demonstrated to improve prophylaxis rates by up to 48% [18, 40]. Thus the attitudes of doctors to VTE prevention and evidence based practice with respect to VTE prevention, and clinical environment in which VTE prevention is implemented, suggest that like the change theories of Grol and Grimshaw , changing current practice with respect to VTE prevention will need to incorporate a multilevel approach taking into consideration the individual doctors, the social context in which they work as well as the organisational context. The complexity and drivers of clinical behaviour and decision making provides a significant challenge to the implementation of evidence based practice guidelines in our health system. However patient outcomes can be enhanced through the utilisation of evidence based practice guidelines and the best possible approach to improving patient outcomes associated with VTE is a coordinated program that addresses individual, cultural and organisational constraints. Nicola H Chapman, Steven P Lazar contributed equally to this work. The authors would like to thank Dr Timothy Brighton for facilitating conduct of the study at Prince of Wales Hospital. NHC participated in study design and coordination, and data analysis, and drafted the manuscript. SPL conducted the interviews, participated in the data analysis and helped to draft the manuscript. MF participated in the data analysis and helped to draft the manuscript. MNL conceived the study and participated in the design and coordination and helped draft the manuscript. BHC conceived the study and participated in the design and coordination and helped draft the manuscript. All authors read and approved the final manuscript.